It seems more than a week since Stampex! From my initial report on what was found on Wednesday and Thursday, the story developed almost hourly some days, with comments on that report, and emails back and forth to determine just what existed - and in some cases how it happened! It is time for a summarisation, as below. This excludes the BPMA Postage Due commemorative overprint which is on the previous hardware, and concentrates on the myriad errors that have been discovered on the output from machines at Stampex and involved in the pre-orders. This is a revised table; comments have been carried over from the post which includes the previous table. §1 Text Error – Stampex Spring instead of Stampex 2014; for 3 hours on 19 Feb; time also incorrect. §5 Lower case 'k' in 'UK', Europe 20g stamp in position 5 instead of position 3. §6 Date Error - On 22 Feb, 22/01/14 on receipt and B1GB14 on stamps (not concurrent with §1). Machines A3 A4 A5 and J1 were the public access machines. Machines B1 and B2 were used for dealer pre-orders. These were not available at the Royal Mail counter. Although I describe this as an error, all the stamps sold direct from Jersey and - I suspect - those sold at the Jersey stand at Stampex will show this variant of the inscription so it shouldn't be scarce. If anybody bought two produced by the B machine with lower case 'k', I would be interested in having one - or even just a single stamp. I'm told by Jersey Post that the machine was reset when the discrepancy was noticed. Hi thanks for the info, the flags also had a the date error all issued were MA13, this was on the other side of the machine with Machins. It's a shame ... and a great business for Royal Mail and dealers & resellers. It has nothing to do with philately. This is all fascinating. But I think what makes this a dividing line for me is that these are on-demand, instant 'stamps'. There is no central production and they are therefore completely vulnerable to the vagaries of a whole host of randomising factors. I've collected all the basic sets including all overprints (and I do really like these stamps - the new Spring flowers are lovely!) but that's my line. This is not a philatelic field for specialised completists! Surely as in any form of collecting it is up to the individual to collect what he or she wants? 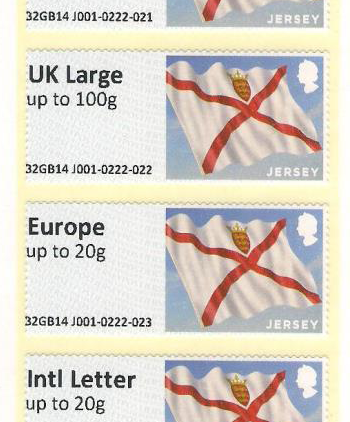 Jersey Philatelic Bureau will be attending congress and a Post & Go machine will be made available for their first ever issue of Post & Go stamps. An overprint for this stamp will also be available. All the above comments have been copied from an earlier post with a summary table. Visited the BPMA & a few other Post Offices today, with a good selection of designs. 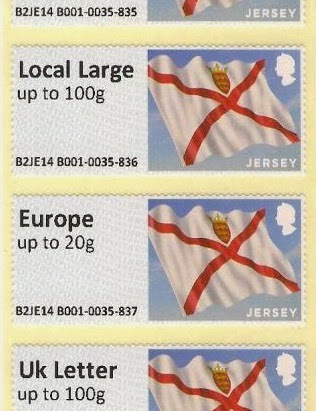 It would have been nice if there had been a decision as to what order the stamps should be appear, but it appears that the two version, the one from Stampex (J001) and the one from the Jersey (B001) are both constant in the respective order, except for the latter lowercase k.
I’m not surprised it Stampex is viewed as it’s best yet, with the variations of imprints and the errors off of A005, it would be a bombshell if it wasn’t. Some may view that as slightly jaded, yes and a lot more than slightly. I haven't heard that 'best yet' comment from Royal Mail. Given that the errors were not deliberate (and not even known to Royal Mail until after Stampex) and not advertised, the customer spend could have been a lot higher. Likewise had output from the B machines been available over the counter as on previous occasions, then sales revenue there could have been a lot higher. And once again it's the dealers who seem to have all the errors? I might add - the same dealers! It is not surprising that the dealers have the errors because they do buy more than visiting collectors. Dealers buy to sell to their regular customers: we have about a dozen around the world who want regular and overprinted Post and Go stamps. But don't fall into the trap of thinking that it is ONLY dealers who have all the errors. The only reason that dealers appear to be the only ones with the errors is that they are the only ones SELLING them. Collectors, in the main, buy small numbers for themselves and friends. The 1st Class Large printing was only produced from the B machine on pre-order so unless collectors also pre-ordered (and there was a minimum order value) they wouldn't get them. The Stampex Spring error on machine A5 was first pointed out to me by a collector, and one of the bigger dealers was only aware of the error when I told him - he had asked about having both MA13 and undated Machins. My reply was that he should look at the earlier blog entry to see the real error and he was pleased to find that he had some of those as well. The Stampex Spring error on undated Machin stock and the Flowers "from A5" were bought by Thomas vL, the German dealer who explained the process in an earlier blog post. A collector could just as easily have found that error and it may well be that they did, and are still to discover that they have a set of Flowers and a receipt for Flags. Some collectors discard the receipts so they may not know anyway. Finally the date error (back to January) was bought by collectors as well as dealers. Collectors (I’m one) often forget that it’s the dealers job to get hold off stock, so are going to be in attendance for more times days than the average collector. It took me 5 visits to stampex, 4 to the BMPA and 3 dealers to get the missing items, which were mainly the back office machines. Yes I did get stuck behind a dealer, but as he has supplied me previously with some of my idiosyncratic request, I can’t complain. I didn’t realise that subject to the minimum spend the ordering the ordering of the back office versions was available to anyone. "I didn’t realise that subject to the minimum spend the ordering the ordering of the back office versions was available to anyone." I know somebody published the link for ordering, but I am not sure at all that this link was intended to be available to everybody. I heard various 'minimum spend' mentioned - £50, £150, £450 - probably the result of 'Chinese whispers'. My own spend was just under the highest of these. I think people should stop "sniping" at dealers. They spend time and money travelling around to source items which collectors are unable or too lazy to get for themselves -and they are entitled to take a profit for such time and money. As a customer you are paying for that time and money - but you are also benefiting from their expertise - and the "unpaid"time they spend in researching the products, which they freely make available to persons who are not customers. Most of these dealers are genuine enthusiasts for the subject - as is patently obvious from this blog. I have no axe to grind - as I only collect used stamps and labels - and so am not a customer or even potential customer and read this blog purely for interest - but I personally find that dealers do provide a large source of free information. It also apposite that Ian and many other dealers often povide "free" information on sources such as "stampboards". The cynics might say that this is in their own interest, but I venture to suggest that the additional revenue generated from this source is somewhat less than the effort expended justifies. Thank you; I knew it was coming but was waiting for the official statement - so there's another new blog entry. So now it’s just A002’s location to be announced. Will this news be greeted with enthusiasm, or apathy or dismay?